Experience the wisdom of your very own faery godmother, and discover the little spark of joy that comes when you are supported in spirit. 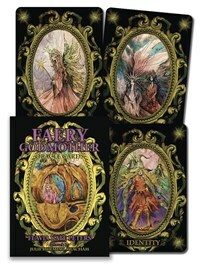 The Faery Godmother Oracle Cards speak to you of emotions, methods, and magic that connects you with the elements, mystical realms, and eternal spirit to bring about a more powerful sense of positivity, change, and growth in your life. The gilded cards are a pleasure to behold. The evocative art provides a sense of comfort for those times when you need it most. Flavia Kate Peters (England) has written for Mermaid & Mythology and is a regular columnist for Faeries & Enchantment Magazine (FAE). She also writes for Spirit and Destiny, Lightworker, Witchcraft and Wicca, Fate & Fortune, and Out & About magazines. She is also the co-author of The Shaman’s Handbook of Sacred Tools & Ceremonies (O Books) and The Book of Destiny (O Books).